The future is here with new technology in skin resurfacing with the MiXto SX®. 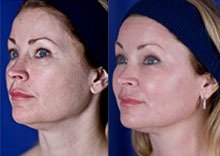 Combining the effectiveness of Carbon Dioxide lasers long known to be the GOLD STANDARD in wrinkle removal with an innovative “quadrant” fractional technology and a more tightly focused beam, the MiXto SX® laser delivers uniform tissue ablation to the dermis causing immediate contraction and tissue tightening. A secondary effect is the production of new collagen over the next 6-12 weeks. This advanced technology delivers powerful results without the harsh side effects and downtime of traditional CO2 resurfacing.The MiXto® treatment is giving all the benefits of traditional laser resurfacing, without general anesthesia, pain and prolonged downtime. 1. What is MiXto SX® Micro Fractional CO2? CO2 is a Carbon Dioxide laser that has been used for more than 25 years in the aesthetic industry for treatment of conditions such as fine and deep wrinkles, scars of various origin, uneven pigmentation and dilated pores. When the CO2 beam of light comes in contact with the epidermis it heats and vaporizes the skin tissue, instantly removing the superficial layers of the skin, scars and wrinkles while smoothing out the surface of the skin. The skin remodeling occurs with new skin and collagen growth. MiXto stands for the mixture between CO2 energy and fractional resurfacing, and the SX stands for surgical, because the laser can also be used to make a very clean incision without bleeding. 2. How does it work? The MiXto SX® gives the Physician more control to regulate the depth of penetration and the amount of heat delivered by the beam. The high speed scanner, driven by a patent-pending algorithm divides the treatment area into four quadrants, or “fractions”, and skips the beam from quadrant to quadrant so that each strike is separated by the longest possible interval. This process is repeated until the entire area is treated. Dividing energy this way allows maximum time for thermal cooling of the tissue, less pain for the patient and faster recovery! Compared to traditional resurfacing of the past this is a big step in technology for both the patient and the physician! 3. 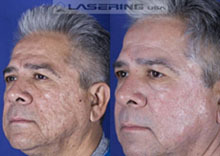 How is this different than other laser treatments? The MiXto SX® delivers more results in a 30-minute treatment than competitors can accomplish in 3 treatments with less discomfort, downtime and cost. 4. Does it hurt? For most patients we apply topical anesthetic and oral tylenol so they are able to drive themselves home. The discomfort is similar to bad sunburn. 5. What are the risks? Erythema (redness of skin): the laser-treated areas have a distinctive redness representing increased blood flow due to the growth of the superficial tissue and collagen. It will gradually fade during the first few days. Inflammation (swelling): Treatment with the MiXto SX® System presents a minimal amount of swelling that can last up to 24 hours. Hyperpigmentation (tanning): This is presented after the third day of the procedure but then begins to shed and reveal younger healthy looking skin. A personal interview and clinical examination will be conducted to obtain relevant facts about your medical and dermatologic history, and any medications you are currently taking or have taken in the past. If you are prone to cold sores, you need to ask your doctor for an antiviral prescription before the treatment. Fractional Treatment with the MiXto SX® has been proven safe for the face, neck, chest and hands. 6. How long is recovery? Most patients are ready to go back to work the next day, but it depends on the patient and their lifestyle. Typical downtime is 7 days. 7. What is the recovery like? The patient is red and can be swollen the next day. On the second, third and fourth day the patient is peeling and can experience a little itchiness typical to a sunburn. 8. When do you see the results? Right away! When we are doing the procedure you can immediately see the skin contract and shrink. The patient will really see the benefits by the time the skin is completely peeled and will continue to see results for up to six months with new collagen regeneration that “plumps” up the skin. 9. Who is the best candidate for this procedure? There are three separate groups the MiXto SX® applies to; the younger patient with severe acne scars, the middle-aged patient with wrinkles and age spots and the older patient with wrinkles, age spots and pre-cancerous lesions. 10. How many treatments are needed? 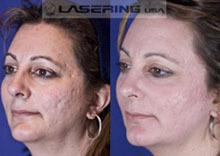 In most cases only one, but for deeper wrinkles and acne scars two or more treatments. 11. Is it just for the face or can it be used on other areas of the body? It is most commonly used on the face but can be used on neck, chest, arms and hands. 12. Is the treatment expensive? The new technology has actually brought the price down, without compromising the results. 13. What is the cost? MiXto treatments range from $1250.00- $3000.00 depending on treatment area for a one-time treatment.